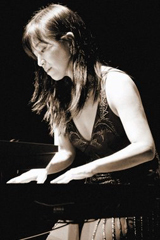 Born Keiko Doi on July 26, 1963, in Tokyo, Japan, began taking piano lessons when she was just five years old. From there, she attended the Yamaha Music Foundation in Japan. She composed her first pieces of music when she was in junior high school. At the age of 17, the Yamaha Music Foundation gave her the opportunity to become one of their recording artists. That same year, she wrote her first major film score. After she finished her education at Yamaha, she attended Nihon Joshidaigaku (Japan Women's University), where she earned a degree in children's culture. While in college, she continued to pursue music and recorded four albums with her jazz group, Cosmos. 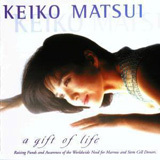 KEIKO MATSUI is an icon of contemporary jazz. With nearly 1.2 million units sold in the U.S. alone and packed concert halls, she is one of the most recognized artists in the genre. Her elegant piano melodies and gentle jazz grooves have enormous appeal and never disappoint her loyal fanbase which she has cultivated with over a dozen albums and stunning live shows. WALLS OF AKENDORA, Matsui's latest recording of all new material, showcases her signature sophisticated jazz style on ten tunes that range from the classically-inspired to bold and brassy. "Akendora," she explains, "is a fictional place of my own device! It is a place that I go to to find peace and to spend contemplative moments." The 'walls' of the title do not refer to any barriers around this haven, but rather milestones. "It's like marking your child's height on the wall. It's about seeing where you have been and where you can go," she explains. Matsui has taken her music to extraordinary places since that fateful day of her first piano lesson. By the time she was in junior high school, she began composing and developing a taste for jazz, drawing inspiration from a variety of classical and contemporary composers ranging from Chopin, Mozart, and Rachmaninov to Chick Corea, Keith Jarrett, and Stevie Wonder. 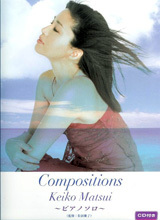 At the age of 17, Matsui was chosen to record for the Foundation, and that same year, she composed her first film score. 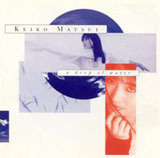 Matsui commenced her solo recording career with 1987's A DROP OF WATER. NO BORDERS (1989), UNDER NORTHERN LIGHTS (1990), NIGHT WALTZ (1991), CHERRY BLOSSOM (1992), DOLL (1994), SAPPHIRE (1995), and DREAM WALK (1996) further cemented her reputation and increased her popularity. 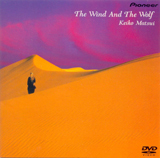 No stranger to the upper reaches of the contemporary jazz album and airplay charts, Matsui was named Top Indie Contemporary Jazz Artist Of The Year by Billboard magazine in 1996. In 1997, The American Society of Young Musicians honored Matsui with its Essence Award, which recognizes artists whose vitality captures "the very spirit and soul of audiences worldwide." That same year, she launched a tour dedicated to raising awareness of breast cancer, and released a four-song CD entitled A GIFT OF HOPE that benefited the Y-Me Breast Cancer Organization. 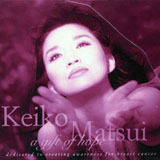 Matsui's music was prominently featured in Say It, Fight It, Cure It, a special profiling several courageous women who were battling breast cancer that aired on the Lifetime cable television network. 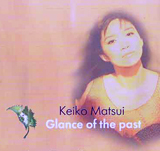 In 1999, Matsui performed at "A Golden Moment," a skating concert featuring Olympic figure skaters Kristi Yamaguchi, Tara Lipinski, Ekaterina Gordeeva, and Katarina Witt that benefited the renowned breast cancer organization, the Susan G.Komen Foundation. 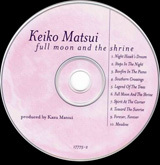 1998 saw the release of Matsui's album FULL MOON AND THE SHRINE, which was accompanied by an acclaimed PBS-TV special entitled Keiko Matsui: Light Above The Trees. The special reflected the multicultural nature of Matsui's life and music and was filmed, in part, at Japan's breathtakingly beautiful 1,300-year-old Itsukushima Shrine and during a high-energy concert in San Francisco. 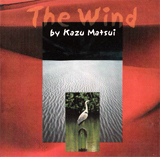 The special earned Matsui a National Smooth Jazz Award for Best Long-Form Video Achievement in 2000. She was also honored as the Best Female Artist that year and again in 2001. Matsui again turned her attention to charitable activities with the release of 2001's DEEP BLUE. Raising awareness of the need for bone marrow donors, particularly in the Asian, African-American, and Hispanic communities, Matsui launched a nationwide concert tour and donated a portion of ticket proceeds to The National Marrow Donor Program and The Marrow Foundation. She also released a four-song CD entitled GIFT OF LIFE to raise funds for the two organizations. 2001 brought about a period of reflection for Matsui and a strong desire to create music that would help heal a world in turmoil. She began to contemplate, "Why am I creating music, and as a musician, what can we do?" Matsui also reflected on the futures of children growing up in a world devastated by violence and hatred. The result was THE RING - an album intended to communicate a message of peace, compassion, and humanity to listeners around the world. Her technical and compositional virtuosity that has become her hallmark, along with the symphonic grandeur of her sound, paired beautifully in this stirring and emotional album. 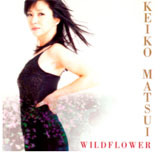 On 2004's WILDFLOWER, Matsui once again used music as a platform for inspiring good. The album's title track benefits the United Nations World Food Programme's efforts in Africa. WFP is the world's largest humanitarian agency which, in 2002, fed 72 million people in 82 countries including most of the world's refugees and internally displaced people. "I decided I wanted to support the WFP after learning about the tremendous problems in Africa and how humanitarian assistance can change people's lives for the better," Matsui said. "So much help is needed there, particularly for the children who have been orphaned or abandoned because of war and AIDS." 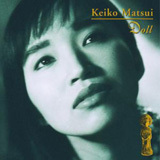 Throughout a discography that dates back to 1987 and her debut recording ‘A Drop Of Water’, the wonderful Keiko Matsui has differentiated herself by continuously crafting memorable melodies that she considers to be reflections of herself. Her latest CD is titled ‘The Road’ from which the title track has just been released as a music video. When I talked to Keiko from her home in Los Angeles I was eager to discover more. 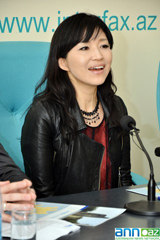 KEIKO MATSUI. Thelonious Monk once said that talking about music is like dancing about architecture. Mere words fall quite short in their attempt to describe the articulate and complex language of music. We can try to pigeonhole artists into categories and genres but it is most often an exercise in futility. The junction created by the music of Keiko Matsui is a wonderful case in point. Keiko began her classical piano training when she was five. She tells us most Japanese children do that. "Even Kazu [her husband and producer] took piano lessons for three months, and quit for baseball." She became equally interested in contemporary jazz, movie sound tracks and pop music. By Junior High she was composing her own music. "Even though my style of music is categorized into jazz right now, classical music has always been a very important and clear influence in my compositions and playing. Jazz and classical can live together without any problems, I think." She admires the compositions of Chopin, Mozart and Rachmaninoff just as well as those of Chick Corea, Keith Jarrett and Joe Sample. 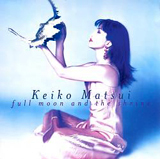 Couple her intermingling of classical and jazz with the fact that she blends East and West musical sensibilities together…If there were an artist that truly represents the idea of jazz fusion, it would be Keiko Matsui. 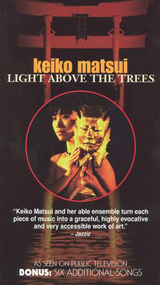 On her Public Television special, "Keiko Matsui: Light Above The Trees," Keiko opens saying "Music is like prayer. That's why I'm here." The "here" she is referring to is the Itsukushima Shrine in Japan. Near Hiroshima, it has been a spiritual place for Japanese people for more than 1200 years. It is an appropriate locale, given the spiritual way in which she approaches music. Her new album is entitled "Full Moon and the Shrine." 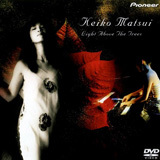 Keiko says the origin of the album and television special are based on a song of the same name. "The tune 'Full Moon and the Shrine' was composed for our Public TV special. The opening scene was shot in Japan at the Shinto shrine which stands half in the ocean. We chose the day of shooting at the highest ocean tide on the night of a full moon. The album project was started with this tune so that we carried over the spiritual air from this shrine into other songs. It was not so intentional, but carrying over the qualities of native spirits of Japan may have become the theme for the album. It is almost like air, and might not be so obvious musically. There are many different music styles in the album, including some R&B. But it was not difficult to have the spiritual air from the shrine into even R&B tunes. Music is one form of prayer anyway. That is where all music originally belongs. The differences of cultural backgrounds has never been a problem in our music making." 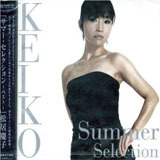 If Keiko's music defies category, it may be because she is a pretty tough one to assort herself. 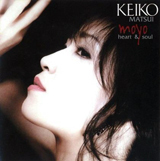 The stunning visual image of her petite beauty is only a point of departure in describing Keiko Matsui. She gracefully drifts on stage, looks up just long enough to flash this angelic smile, and when she gets behind the keyboards, all of a sudden that delicate flower doesn't seem so demure anymore. She plays with conviction and a raw energy that leaves you saying "Where did that come from?" On the road, she has no trouble relating to the sometimes unruly lot of musicians with whom she shares the stage. Then, there's Keiko the mom. She two daughters, nine year old Maya and year old Mako. She periodically sends us pictures of the girls. We hear, via a Matsui newsletter, what costumes they wore Halloween and that Mako is taking out her "terrible 2's" on her nice sister's homework assignments. Even Keiko's place of residence a bit complex. She has a home in Tokyo and one here in Huntington Beach. "We commute to L.A. almost every month. For example, last year we made 14 round trips between Tokyo and L.A.. Combining all our stays in the U.S., spend about five to six months here. That means our car is parked at the Narita Airport five to six months a year." It was music that originally brought Keiko to Southern California when she was 18 years old. She was an artist for the Yamaha Music Foundation and they gave her an opportunity to record on a project called "Session III." It was fate that brought Keiko and Kazu together in 1984 when he produced one of her concerts in Tokyo. The two have been married for 12 years and Kazu has produced all nine of her albums. When she performs live, Kazu usually jumps on stage for a couple of numbers. Since Keiko and Kazu work so closely together, we asked them each what the best and worst things were about their arrangement. 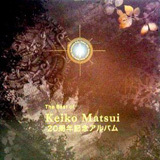 Keiko said "No one else can try to make my album become the best album more than he does. Of course sometimes it is difficult to be a wife and an artist at the same time." As for Kazu: "The best thing is that we can be together all the time…Not as a producer and an artist, but as a husband and a wife. The worst thing is, by working with my own wife, realize who I am. So I am still working on my character to be better, and she has already a good character." Extraordinarily generous in every aspect of her life, Keiko is long on good character. Last May she launched a national tour dedicated to raising awareness and funds for breast cancer prevention and for the Y-Me National Breast Cancer organization. When the "Gift of Hope" tour hit Los Angeles, the House of Blues became the House of Pink for one night. (Pink is the color for breast cancer awareness.) In October she continued her support for the cause, scoring music for the Lifetime channel documentary "Say It, Fight It, Cure It" hosted Rosie O'Donnell. "I have been so fortunate in my life. I can make a living doing what I love to do. I have two great daughters…I wanted to do something for some cause through music. have lost a close friend to this disease. She was very young." Keiko is the sort of mother any kid would hope to have. She happens to be a gourmet cook and accomplished sailor too. So striking is her beauty, she was photographed by Herb Ritts for an international GAP ad campaign. 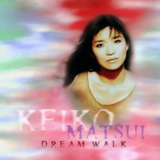 Her "Dream Walk" album ended up as the third best selling contemporary jazz album of last year. She was the only female artist to even make the chart. How do you classify someone like that? I first heard the Shakuhachi played by Kazu Matsui in 1978 on the sampler album of Yutaka Yokokura's LOVE LIGHT released from Alfa Records, Tokyo. The album was given to me by a close musician friend of mine. 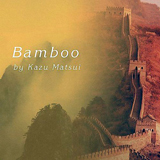 I was fascinated by the exotic sound of the tune called Breath of Night which featured Kazu's bamboo flute, the Shakuhachi. Kazu has produced more than 60 albums. He has worked with many artists including: David Lindley, Carl Anderson, Greg Walker, Phillip Ingram, Robben Ford, Larry Carlton, Lee Ritenour, Steve Lukather, Jimbo Akira, Ravi Shankar, Kenny Loggins, Ry Cooder, Joni Mitchell, Danny O'Keefe, Patti Austin, James Ingram, Peter White, Chaka Khan, Philip Bailey, James Honer... and so on. Now I can see that Kazu aims at a very unique approach using the Shakuhachi's breath time when he produces Keiko's music. 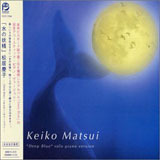 Most people are attracted by Keiko's sing-and-talk-like piano melodies. Hard work and the discovery of jazz in her teens led Keiko Matsui to an illustrious career that has spanned multiple decades. 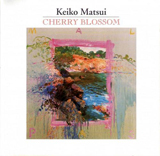 Not only is Keiko Matsui a world-renowned jazz pianist, she is also a composer and producer. She has travelled extensively in order to bring her music to a vast number of places and people. She creates her own kind of music by melding together her passion for all different types of music. She has had an illustrious career that is full of albums, accolades, and charity work. Keiko (pronounced Kay-Koe, which means ‘happy, celebratory child’ in Japanese) was born in Tokyo, Japan in 1968. At the age of five, she started taking piano lessons, as it is believed in Japan that if you learn a skill at five, it will continue for the rest of your life. This fact did hold true for Keiko. It was in junior high that she developed an interest in jazz. Years later, she attended the Japan Women’s University for Children’s Culture and the Yamaha Music Foundation for piano. At 17, as one of the Foundation’s top students, she was chosen to record music for them and joined Cosmos, a Japanese jazz-fusion group. They recorded seven albums together. 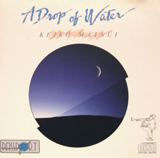 In 1987, her career success continued when the 19-year-old she was sent to the United States to record her first solo LP, called A Drop of Water. Her first single to be released in the America was in memory of the people who died in the Space Shuttle Challenger disaster of 1986. The success from her first LP led to her being signed by MCA records, and she went on to record two albums with the label (Under Northern Lights in 1989 and No Borders in 1990). In the late 1990s, she saw a rise in popularity. In 1997, she was number three on the Billboard’s Top Contemporary Jazz Artists and she was the only female in the top ten. That same year, her albums Sapphire and Dream Walk were on Billboard’s Top Ten Indie Jazz Albums. It wasn’t until 2001 that she reached the number one spot on the Billboard charts with her album Deep Blue. Her early sound can be described as a fusion of east meets west. Though with subsequent albums, like Under Northern Lights, her sound became more in line with smooth jazz, which is sighted as reasons why her MCA releases did not do as well as expected. Her sound changed again with the release of Sapphire on White Cat Records in 1995. She now incorporated Latin, world music and funk into her sound to great success and praise. She has continued to experiment with the sound. In 2000, she incorporated soundscape, which involves adding sounds from the environment, like animal vocalizations, weather and other natural elements. 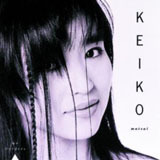 Many of her fans did not follow Keiko into this new sound venture, but many welcomed the change. 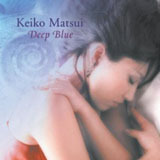 Though her sound changed, her success continued, as she made history by being the first Japanese artist to top the Billboard’s Contemporary Jazz Charts for three consecutive weeks with her 2001 album Deep Blue. 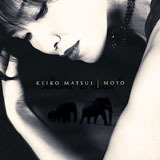 In 2011, Keiko released The Road, her first album in four years. This follows her success of Moyo, which was inspired by the South African music. Her latest release sees the first time she recorded with her road band and produced. She borrowed from jazz, blues, rock, and traditional music from all over the globe. From her world travels, her musical influences continue to expand. 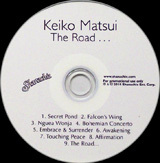 The Road is a collection of music that is passionate, emotional and timeless with the incorporation of exotic melodies and global rhythms to create a unique and wonderful sound that is truly Keiko. Her passions extend outside of music. She is involved in a variety of charities, including The United Nations Food Program, The Be March Marrow Registry, and the National Donor Program and Marrow Foundation. The National Donor Program and Marrow Foundation encourages people of ethnic minorities to register as marrow donors in hopes of providing chances for those of a similar decent to find matching donors. She has also worked with the Y-ME National Breast Cancer Organization. In 1997, she gave her earnings from her mini-CD A Gift of Hope to the organization. Her music was featured in “Say it, Fight it, Cure it”, a Lifetime special about breast cancer featuring many women who were battling breast cancer. 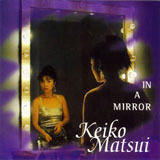 Keiko has had a great career and changing sound that has seen her release thirty solo albums from 1987 to 2011 on a variety of different labels. With no signs of stopping her great musical adventure, there is no telling what amazing musical gems Keiko will produce next.